https.in Blog > SSL Certificate > Microsoft not to support Internet Explorer. Global giant Microsoft had decided to stop supporting the popular browser Internet Explorer long back, however, there are older web apps which still uses Internet Explorer. Microsoft cautions it as perils of using Internet Explorer, which is the reason why they do not support the newer standards of Internet Explorer and Microsoft has even stopped testing for their sites, Microsoft has used various methods to discourage organizations that are using Internet Explorer but has not been very successful. The exploiters are deploying Internet Explorer (IE) remote code execution vulnerability by integrating Crypto mining software to mine Monero, hence compromising the Windows PC. Consider, the case of a Zero-day attack, IE allows the attacker to execute arbitrary code and corrupt the whole system. 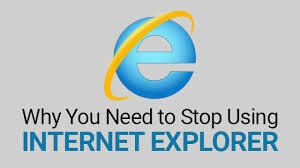 The method to trigger the malware is first, it must have an Internet Explorer, and he decides to open the infected office file, this uses the Windows User Account Control, which the pop-ups are expected to prevent the unverified running of scripts, primarily, open the unverified office file by using Internet Explorer, this will trigger the malware. The hackers can find out which software is being used and find a method to control them, whereby hackers access the whole network without being detected and then exploit the loopholes to attack. Hackers don’t only explore the security software but also look at other software which can be attacked in future, the hackers then share the information within the hacker’s community, they study the company’s users and find out the vulnerabilities to gain access to the data and the systems. Experts opine that this is possible because of the integration with Windows software, this is giving access to the other software features, unlike other third-party browsers like Firefox or Chrome. Concludingly, Chrome is the most used browser since it is solid and reliable, also it is fast and adapts any device, also it supports many different extensions and customization like a password manager, ad blocker and productivity tools. In the recent past, Cathay Pacific had a major data breach which affected over 9.4 million passenger’s private data like passenger name, date of birth, email, address and amongst other info the historical travel Information, this was detected in March last year. Though according to Cathay Pacific no personal data was misused, they were exercising extra caution by informing all who could be affected, but the data can be used to launch a targeted attack.